Navasi has good detail on the body and weapons. The cloak is nice. Her head is not great. The face is low-grade at best with barely enough detail to discern the nose and mouth. The eyes are surprisingly detailed with a pupil and sweeping upper lid. She even has very fine eyebrows. Her legs feel hearty enough that they shouldn't break off at the ankle. The mold appears to be two pieces, front and back hidden well enough by the cloak, but there is excessive glue around the seem which is disappointing. Overall, I give her 3 stars. The detail is best on Keskodai, but he suffers from a lot of frail pieces: arms, staff, upper legs, and various appendages. The plastic material is fairly soft so it should be okay, but I would fear some breakage if dropped from the table or tossed in a shared storage space. The eyes are solid yellow and could have benefited from some black dots or something to make them look multifaceted. 4 Stars. The Sunrise Maiden is the only ship I intend to buy. I skipped out on the two fleet packs as I have plenty of alternatives for ships. If they would have produced the Drake or Pegasus or perhaps some of the enemy ships from Starfinder Organized Play (Jinsul attack fighter, etc), I think it would have encouraged more sales. Overall the detail on this model is nice. It has some smooth lines and some sharp edges that give it a sleek, fierce look and the color scheme is inviting. I'm glad they decided on a hex base to match the standard battlemap used in Starfinder. Of the models in this set, it is the one I like the best. 5 stars. Overall, while I like the models, I think the combination of long wait time left us expecting much better detail. Wiz Kids could have easily produced models just as detailed in less than half the time and for a lower price point. We should hopefully get an update on the release date sometime this month. Personally i expect these getting moved from march to either april or may (to be released together with the first wave of the Kickstarter mins). Considering Ninja Division/Soda Pop's history, I can't say I'm surprised. I'm sure there's a lot of behind-the-scenes business stuff that we, the end users, have little idea of. But would it be presumptuous and snarky to wonder if Paizo is taking these delays (as well as the aforementioned history) into account regarding continued relations with Ninja Division? I can't help but observe that WizKids doesn't seem to have these problems.... I'm sure there's a good reason Paizo isn't using WizKids for Starfinder? WizKids were approached about Starfinder minis but weren’t interested (as were reaper). FWIW, they also had some scheduling issues and slippages early in PFBattles’ evolution. See? I knew there was a good reason! I’ve not had any dealings with Ninja Division before, but based on their SF Unpainted Minis Kickstarter I’m unlikely to continue supporting them. I may not be able to help myself (since the figures I’ve got from them have been great) but I really don’t like the way they deal with their customers. 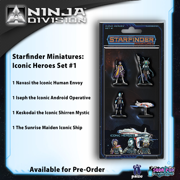 Our give-Starfinder-a-try campaign will likely be long over by the time these are released. Pretty flipping ridiculous these are not out yet. I have heard these will neither be available in april (obviously), nor may, as ND will focus all it's energy on fullfilling the first wave of the unpainted resin kickstarter and only consider releasing these after all backers have received their first shipment. Greetings, all. Here's an update for you. All pre-paint sets (Iconic Heroes 1 and 2, Corpse Fleet, and Pact Worlds Fleet) are approved and in production. They'll be releasing on August 2nd at Gen Con and should be at your favorite local game store at the same time. The KickStarter wave 1 miniatures are also in production and will be shipped to backers this month. You can read Ninja Division's latest update here: https://www.kickstarter.com/projects/325468910/starfinder-masterclass-minia tures/updates. Don't know whether to be happy these are finally coming out, or ticked-off that they are coming taking so long to come out? Also, Ninja Division had about a dozen Starfinder minis available at GenCon 2017 that I failed to pick up and I have never seen since. Clearly Ninja Division had the ability to produce these for GenCon. Was there never a second product run made on these? Those minis that Ninja Division showed at Gen Con 50 in august 2017 were hand painted prototypes (i don't know if there were actually any for sale). The minis now coming out on august 2nd 2018 (1 year delay) ARE the second product run (actually the first, since the others were prototypes). The problem with these will be the price ($40 for four characters & $36 for three starships) & the non-availability for single starships of which more than one can be used (the tiny, small and medium ones). I'm also very pessimistic about getting ppm versions of the monsters produced for the Kickstarter anytime soon, if ever, as the Kickstarter will probably be fullfilled first and that will take all manpower of ND in 2018. I see them doing a second KS before producing additional painted plastic versions, because it will make more money (the high price of the ppm packs does make high sales numbers seem unlikely). It would be nice if these actually come out at GenCon, but considering that they're already a year late as well as being woefully overpriced, I'm not holding my breath. Like a lot of other folks, I'll believe these minis are available when they're actually in my hand with cash on the counter. And if I didn't think I owed my players the best possible experience when they play pregens, I would refuse to buy any NJ products ever, just based on all these issues. Wave 2 of the Kickstarter resin minis shipping now to north american backers includes the 4 minis in this set ( and set 2). As i suspect they use the same molds to create the ppm versions, we could really see some actual sets 1 & 2 being sold at Gen Con 2018. It could take some time for these to reach stores outside of North America though. We'll see if i'm right or not if the iconic sets become available, but the starship packs don't, i guess. unfortunately it doesn't look like these are gonna release in august atm. At what point are we just going to give up on these? Sorry, but a year late is utterly ridiculous. There's absolutely nothing on the product page to imply that these are anywhere close to being released. Paizo won't be able to ship these with the august 2018 releases, as they don't have any in stock yet. I also heard these weren't available at Gen Con at all. Late or not, these price points are a pretty solid guarantee that I'm not going to be buying-in on these. Most of my fellow local SFS players agree, and we're all saddened by this. There are several online shops that offer these for $29.99. The pre-order prices won't hold. The Fleet packs are even less. It's very questionable if these will be available in Europe in september. Blackfire doesn't offer them yet, but they already offer lots of stuff shipping next year. Why are these now listed as "unavailable" instead of "preorder"? "Hey Marco, Yes we can confirm that the pre-paints have begun to arrive in distribution and we've received ours for Paizo.com. Ninja Division has not set a uniform street date for these so the next step for us is to try and find the best date to begin shipping them out to those that pre-ordered from us. Most likely this will begin later this week so get your pre-orders in while supplies last (or go to your local FLGS and grab/order them)." I recieved an email today these will finally ship to me. Still havent heard hide nor hair from the kickstarter. This month's shipment is a heavy blow to my bank account, as a number of items that have been in my sidecart for months are finally shipping. That seems to include all of the pre-painted Starfinder miniatures. I picked the prepainted ones up at my FLGS today. And while the the wait was still irritating, I can say I was pleasantly surprised. The paint job, while not as bright, is actually better than the ones you see in the pictures. The figs themselves also have a lot of fine detail, so they would be great for repainting is that's something you like to do. Finally, they are made of a more flexible plastic than the last few Pathfinder Battles sets from Wizkids, which means they are less fragile. Overall, I am very pleased with them. Miniaturemarket also has these sets now and they look really good! Anybody have street pictures of these? It looks like they've hit secondary markets, (at least MM), which is good, but I have yet to see any customer pictures or reviews of these guys. There is a seller on ebay who has pictures of the packs and they look good even through the plastic bubble wrap. "Ninja Division is extremely chaotic." Are they available now ? They are in NA & should be part of Paizo's december shipment. Europe will probably get them in december. I received my sets today and they're quite nice. I'm glad I picked them up, they should complement my Star Wars minis very well on the table. Are there any unpainted minis from there kickstarter in any shop?